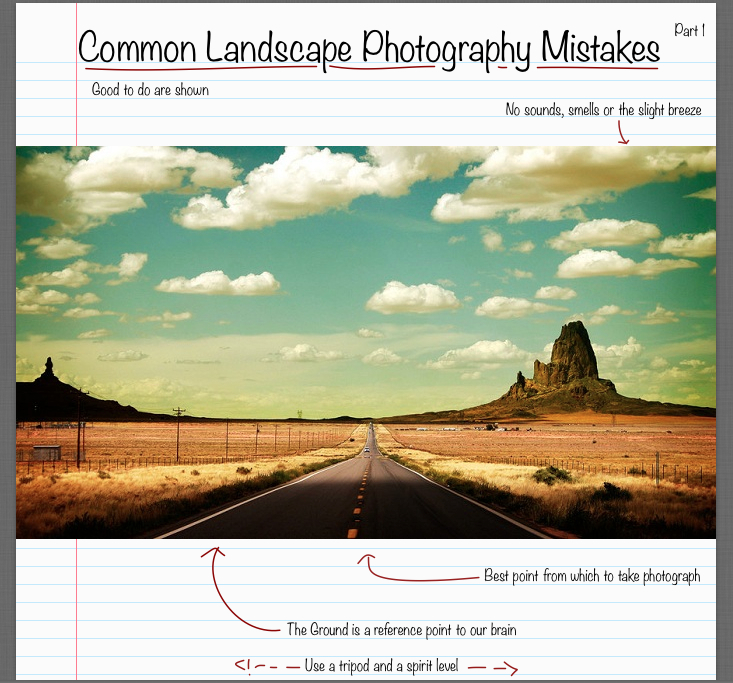 Common Landscape Photography mistakes can ruin a landscape photography. This list is not intended to be very scientific, but a series of anecdotes and recurrent things that we have observed over the years though various forum discussions. If you are interested in landscape photography, we can surely predict that you have already read numerous articles and tutorials like how to improve in Landscape Photography. These are useful in their own way, but the best thing to make progress is to analyze our own mistakes. Basic article on Landscape Photography, Landscape Photography – From Shooting to Editing are quite good point for the beginners to start with. Common landscape photography mistakes are not that uncommon than might appear from the textual meaning. It is important to remember that the brain interprets a scene in a very different form versus looking at a photograph. When the senses send information to the brain to maintain the high level of interest, it becomes cherish-able. The brain does not care if there is nothing in the foreground because it chooses to focus on the beautiful mountains on the horizon, using the remaining senses to create a moment full of emotions. The brain remembers a scene as “the sum of it parts which are the most beautiful”, probably by shifting the focus to some other equally beautiful scenery after a few moments. This is, in contrast when we look at a photograph, which can only capture a small part of the whole experience. For this reason, photographers must work with difficulty to capture the elements that the brain notices the most and most importantly, filter elements that the brain can filter but not the camera. The human brain is attracted by the beauty and filters all the things considered unattractive to focus on. The camera does not divide the good things from things the brain thinks ugly and it is up to the photographer to transform the image into an artistic composition. If you want to get a beautiful landscape photography, you have to be prepared to spend a lot of time to find the best point from which to take photograph. If your wife or your kids start to get bored, leave them at home. Unless you are not lucky, you should expect at least an hour of preparation for a great shot. We must explore the area to find the best spots and wait for the light, clouds and other things to be in place. This is something that should not be made in a hurry. Take too much time to make shots from different angles. When photographing landscapes, uncontrollable instinct is to shoot with the camera horizontally. The fact is that, most of the times it will be the best option. However, it is not always the case. Sometimes a scene demands to be photographed with the camera held vertically and sometimes it is almost impossible to tell which will be better, especially if you are a beginner. Easy, try both. Shoot horizontally and then rotate the camera 90 degrees and make some shots vertically. There is no excuse for a horizon that is not straight; use a tripod and a spirit level to make sure that your camera is absolutely parallel to the horizon. It is best not to use the spirit bubble often included in some the camera, because they may not be accurate. Whichever option you choose, do not try to assess by eye, the appearance of the landscape can be very disorientating more than you think and although you can straighten in post-production, inevitably lose part of the image. Too much information creates confusion in our brain – minimalism is the rule now. Obviously, the second part will be published at next time replacing this sentence. This Article Has Been Shared 6356 Times! Cite this article as: Abhishek Ghosh, "Common Landscape Photography Mistakes," in The Customize Windows, July 11, 2013, April 26, 2019, https://thecustomizewindows.com/2013/07/common-landscape-photography-mistakes/.